The Opera di Santa Maria del Fiore Museum in Florence very centre, a stone's throw from Hotel Loggiato dei Serviti proposes a great collection, above all works and sculptures belonging to the original decor of the Cathedral, the Campanile and the Baptistery. 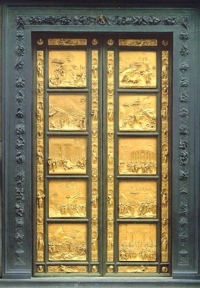 For sure the greatest attraction of this Museum are the original Gold Doors by Lorenzo Ghiberti, Florentine sculptor and goldsmith of 1400: they're so beautiful and stunning that Michelangelo himself used to call them "The Doors to Paradise". After 27 years of restoring, to remove the damages caused by the Florence flood in 1966, the doors are now exposed in all their splendour in the Santa Maria del Fiore Museum.